The funball playground classic is back! Throw the ball in the top, and wait to see which of the 3 openings it comes out. Then the fun begins, as kids scramble for the ball. Repeat this process ’til the cows come home! Available in a standard model or a special model for physically challenged kids. 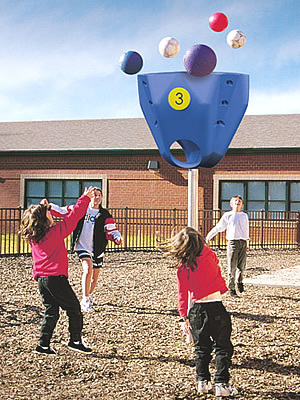 The funball catcher is made from tough roto-molded polyethylene shell. The chute openings measure approx. 12″. The set is 8 feet high and weighs approximately 161 lbs. Colors available: blue only. Recommended ages: 2-12. Manufactured by Childforms, Inc. This funball set lets all of your kids join in on the fun! It’s fully ADA compatible. The hoop is made from sturdy, roto-molded polyethylene, and its outside diameter is 30″. The ball openings measure 10.5″ around. The funball set weighs 161 lbs. and measures 5 feet high. The post measures 2-7/8″ outside diameter. Recommended ages: 5-12. Manufactured by SportsPlay, Inc. Please note that actual appearance of the Funball Set may differ from the photo shown here. 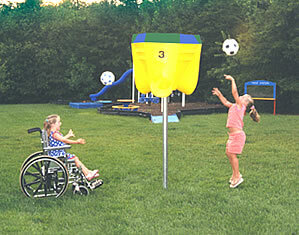 If you have questions about the funball sets, call us TOLL FREE at 1-877-840-0707.